This month’s featured author is another one of our favorites: Salman Rushdie. Rushdie has a new book coming out on Sept. 9 titled, Two Years Eight Months and Twenty-Eight Nights . Keep reading to learn more about Rushdie and to see our rankings of his books. Salman Rusdie was born on June 19, 1947 in India and was educated in England from the age of 14. After graduating university he lived with his family in Pakistan until returning to England to work as a copywriter. He published his first novel, Grimus, in 1975. Since then, he has made numerous important contributions to the world of literature. Rushdie is a fellow of both the British Royal Society of Literature and the American Academy of Arts and Letters. He has won numerous awards including the Whitbread Prize for Best Novel, the Writers’ Guild Award, and the Man Booker Prize. He has written eleven novels, a book of short stories, and four non-fiction books. His second novel, Midnight’s Children, won the Booker Prize, the James Tait Black Memorial Prize, an Arts Council Writers’ Award and the English-speaking Union Award. In 1993 the novel was named the “Booker of Bookers,” the best novel to have one the Booker Prize in the award’s history up to that date. In 1997 he was knighted by Queen Elizabeth for his “services to literature.” He has published essays, non-fiction, short stories, and eleven novels. His is an Honorary Professor in the Humanities at MIT and in 2002 he was elected to the Board of American PEN. 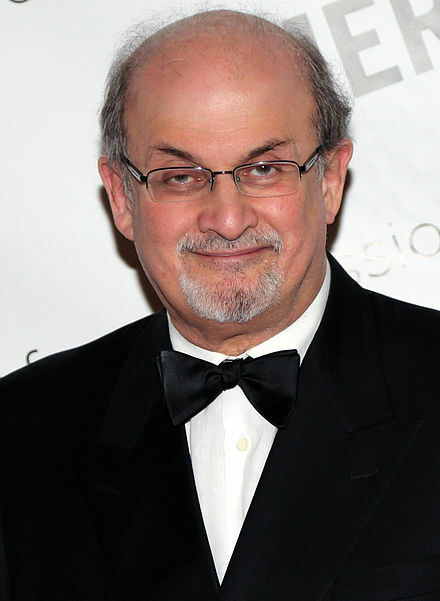 He is perhaps best known for the controversy and events surrounding his publication of The Satanic Verses, which was accused by Muslims as being blasphemous and mocking of their faith. On Valentine’s day 1989, the Ayatollah Khomeini of Iran placed at fatwa on Rushdie and any individuals involved in the book’s publication. In the aftermath of this declaration, the novel’s Japanese translator was stabbed to death, the Italian translator was stabbed in his his own apartment, its Norwegian publisher was shot three times in the back, and Rushdie was forced into hiding. To read more about how this impacted the author’s life, you can check out this New Yorker article. Midnights Children: 5 stars. I loved this magical realism story about the children born around midnight on the day India achieved independence from Britain. Each child has a special power but how they choose to use their power, and what this leads to, makes for a fascinating read. Grimus: 4 stars. A morality tale about the downside of immortality and why it must be an informed choice to accept it. Magical realism combined with folklore and story telling. Shame: 3 Stars. the story of three sisters who share everything including a son. Locking themselves away from the world so no one knows which woman is pregnant, they spend their remaining life isolated — creating unforeseen consequences when their son ventures into the world outside. I have enjoyed Rushdie’s work even though I find them challenging. They are highly intelligent, packed with symbolism, and fun to read. I’ve read some of his essays and non-fiction works and only two novels (to be fair, I’m not finished with the second one). I like the magical realism in his works and I am admittedly very excited to have obtained an advanced copy of his newest work (we will publish a review of it soon). Grimus: 4 stars. Part fantasy, part folk-tale, and part science fiction, this book is a blend of mythology, mysticism, and religious symbolism. It tells the tale of Flapping Eagle, a Native American man who becomes immortal and wanders the world for 777 years, 7 months, and 7 days until he attempts suicide and ends up in another world (a parallel dimension). The book is based on a 12th century Sufi poem and covers themes of human identity and meaning. What a wacky book! It was like nothing I’d every read before but I really enjoyed it for reasons I can’t quite describe. I’m sure many people who read this book will hate it because at times it seems nonsensical. There are flaws (I think he tries to pack so much that the story line becomes sometimes convoluted), but interspersed with the moments of nonsense there were some real gems. Rushdie raises some interesting questions about human nature, spirituality, and cultural isolation. Satanic Verses: 4 stars. I’m about 75% done with this book after two months. I’m not going to lie, it’s a challenge to read and is very dense. In many ways it reminds me of Ulysses and Rushdie himself proclaimed love for Joyce. It’s no coincidence that the book is jam-packed with Ulysses references. I am struggling with this book because I lack a background in many of the religious concepts he discusses. I am using a guide to help me understand some of the symbolism. It’s an intelligent and enjoyable read for me, but it is one that requires a significant amount of effort and concentration. I will post a full review once I’m done. We want to hear from you! Have you read anything by Rushdie? What did you think? Have any of you read his latest book? What did you think? I do think his books are challenging. I’ve been reading Satanic Verses on and off for two months now. I’ve found the best approach is to go very slowly and use a guide. I used the same strategy for Ulysses. Love Rushdie! Midnight’s Children and Haroun and the Sea of Stories are my favorites so far. I’ve got a way to go before I’ve read them all, but I look forward to each one. He is tough, but worth it. I’ve read the short story “The Free Radio” and an essay about postcolonialism by Rushdie, both of which I enjoyed. I’ve never read any of his novels though, and the only ones I knew were The Satanic Verses and Midnight’s Children. Thanks for directing attention to Grimus! Thanks for the heads up. Maybe I should read more of Rushdie’s short stories before I attempt any of his novels. If you do read any, stop back later and tell us what you thought!